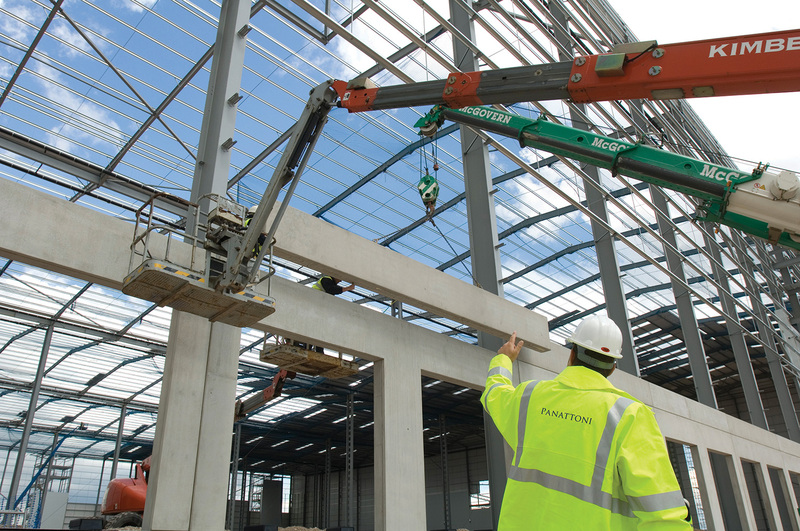 As part of its continued commitment to undertaking over 3 million sq ft of speculative development during 2018, Panattoni has broken ground on their latest development: Wolverhampton450, a 450,000 sq ft industrial logistics building, which will reach completion in October 2018. The building, which will be a cross-docked unit boasting 60 dock level doors and two 50m yards, is located close to the M6 Junction 12, just over 10 minutes drive from Jaguar Land Rover’s Engine Manufacturing Centre at Tyseley. Panattoni’s Simon Jenkins, Development Director and Andrew Preston, Development Manager, were joined by Alison Thomas, Communications Manager for Stoke-on-Trent and Staffordshire Local Enterprise Partnership and Mike Sutherland, finance lead, Staffordshire County Council, who led the ground-breaking ceremony on Tuesday 20th March. Wolverhampton450 is being built to BREEAM ‘Very Good’ and EPC A standards and is in an already established and successful location; with the future occupier benefiting significantly from both the site’s connectivity and the area’s highly-skilled labour force. The investment by Panattoni will create up to 500 jobs for the region which boasts many major industrial and logistics operators. Mike Sutherland of Staffordshire County Council said “Panattoni’s development getting under way is further demonstration of investor confidence in Staffordshire and of the county’s continued successful economic growth. The County Council, working with the local enterprise partnership, delivered the essential access infrastructure to Four Ashes Business Park which paved the way for development. Stoke-on-Trent and Staffordshire LEP chairman David Frost CBE said: “The Four Ashes development is further proof that Stoke-on-Trent and Staffordshire is proving to be a very attractive location to do business. Our can-do attitude and strong partnerships across the public and private sectors are opening up development opportunities and creating a welcoming environment that enables businesses to grow and flourish. The agents representing the site also attended the ceremony – Richard Harman and Tom Fairlie from DTRE and Carl Durrant and Richard James-Moore from JLL. For further information, please contact Asgoo Pirbhai at Reach Marketing on 0116 233 5565.